SOLA Annual Conference 1st time in eastern part of India withhuge participation from all the students & private practitioners. The Conference was well organized under the guidance of our D.C.I. President Dr. Dibyendu Mazumder, D.C.I. Secretary Col.(Retd.) Dr. S. K. Ojha & team SOLA. The local organising Secretary, Dr Aditya Mitra & his team worked very hard & made it a grand success. The conference saw huge participation of more than 400 delegates from across the nation including private practitioners, PG students from various dental colleges, and faculties of renowned institutes. The conference gave them a chance to learn about the recent advances in Laser Dentistry as the 14 International speakers from across the globe and 16 National speakers shared their experience and knowledge in the span of 3 days during the conference. In his inaugural speech, the president of SOLA International; Dr. Andreas Moritz emphasized about including Laser Dentistry in curriculum of Dental Education as is incorporated/ practiced by them at their native institute in Vienna, Austria. He also promised to extend a helping hand to the Indian fraternity of Dentistry in developing Laser Dentistry in the curriculum of Dental Education. His proposal was very well accepted by the co- chief guest Dr. Mazumder, President DCI . Dr. Kresimir Simunovic discussed the use of Lasers in periodontology and drew our attention towards the effect of the Laser parameter on the clinical result along with the comparative consideration of different types of lasers. 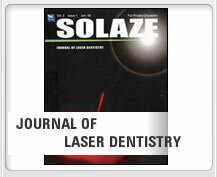 Striving to disseminate the knowledge of the Applications of Lasers in Dentistry and peri oral region, the team of SOLA India compiled a book “A Clinical Guide on Oral Laser Applications”. Mr. Jaynarayan Vyas, honorable minister, health and family welfare, government of Gujarat, inaugurated the book. He was very much impressed with the scope of Laser in Dentistry. Hence, in his inaugural speech he emphasized upon incorporating Laser education and training in 2 Govt. Dental colleges and 24 public health centres across State of Gujarat. Dr. Mohan Vakade highlighted the advantages of Lasers in day to day practice mainly the bloodless and painless dental procedures which can be performed with various lasers. Padmabhushan (Brig)Dr. Anil Kohli, President Dental Council of India emphasized the need to introduce Lasers in Dental curriculum in Dental colleges across India. Dr. Anil Shah in his Presidential address urged the principals of various colleges to implement laser related studies and impart laser education at undergraduate level. Dr. Naresh Thukral focused mainly on explaining the characteristics and mechanism of a Laser light and differentiated between the characteristics of different types of Lasers used in clinical dentistry. The scientific sessions were laced with experienced national and international speakers and blended with more 15 free papers from colleagues all over the country we were pleased to know the amount of laser treatment being conducted clinically and scope it in future. Dr. Franziska Beer and Dr. Moritz along with their team of SOLA International obliged the participants by their presence at Mumbai. This being the 1st National Conference on Laser Applications, they drew our attention towards the emerging importance of the use of lasers in dentistry and planted seeds of curiosity in the budding Dentists to evolve their knowledge of the scope of work and its limitations.